With spring in the air a tasty seasonal lamb dish, low in fat and high in flavour, is just the thing. 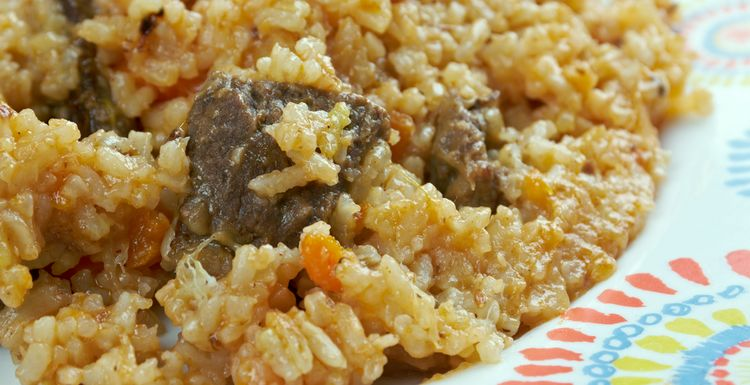 The benefit of this pilaf is that you can make the meat go further. Choose high welfare meat for fuller flavour. Season the lamb with plenty of salt and pepper. Heat the oil in a large frying pan over a high heat. In batches, add the lamb and fry, for 4-5 minutes until golden brown. Set aside. Add the onion, season and fry over a medium heat until softened. Add the garlic, ginger and ras el hanout and fry for 2-3 minutes. Tip in the rice and stir to coat in the oil. Add the lamb and the stock and stir well. Bring to the boil and cover with a lid. Turn down the heat and simmer for 10 minutes. Stir the apricots and chickpeas through and warm for a few minutes, before scattering with parsley and serve. Yes Charlie, that's the trouble - lamb is pricey. So adding pulses, like in this recipe, is something I've always done. Lentils also go very well with lamb. this really grabbed my attention! Had to look up ras el hanout - turns out to be a spice mix - so I may be cheating by mixing my own, but otherwise I can get all the kit easily. Lamb is so pricey so anything that makes it go further gets my vote. I love lamb and I have never used it in a pilaf. What a great idea. I will be trying this for sure.